Toronto's 52-year holiday tradition is just around the corner and the city has some spectacular things planned for this year's celebration. The Cavalcade of Lights is making its highly-anticipated return on Saturday, November 24th. 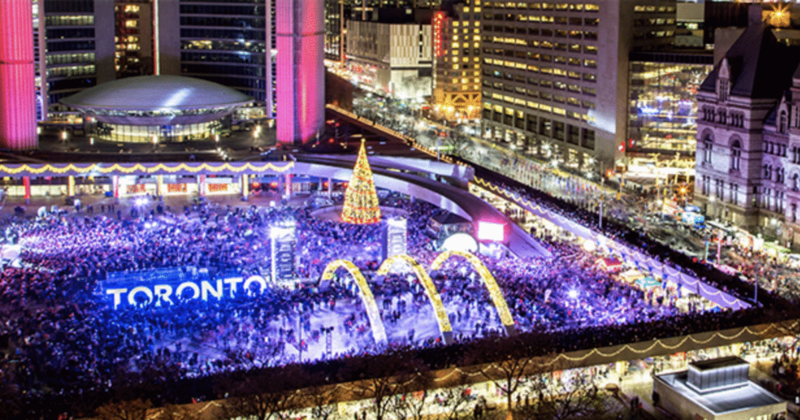 As always, Nathan Philip's Square will be completely transformed into a Christmas wonderland, adorned with over 525,000 energy-efficient lights and 500 ornaments. The city's official Christmas tree will be on display, standing at 60 feet (or 18 metres) tall. The celebration will be packed attractions, including musical performances, circus arts, a skating party and a spectacular fireworks display. • Skating Party with DJ Sean Sax, sponsored by Tim Hortons, 6 p.m. – Spinning hip-hop and funk classics, this veteran DJ has been a prominent fixture in Toronto's music scene for more than 25 years. • Tanika Charles, 6:50 p.m. – A Polaris Music Prize and 2017 Juno R&B/Soul Recording of the Year-nominee, Charles is a staple in the Canadian soul scene. • Tami Neilson, 7:40 p.m. - Known for her powerhouse vocals and soulful voice, Neilson's music is straight from the golden age of country and rockabilly. • Illuminair, 8:25 p.m. – Toronto's acclaimed circus performance troupe is known for its breathtaking shows using fire and light. • Concert featuring Kobo Town, sponsored by Great Gulf, 8:40 p.m. – Toronto favourites and 2018 Juno Award World Music Album of the Year winners are known for their distinct calypso-inspired sound mixed with dancehall reggae and trombone-heavy brass. • Skating Party with DJ Dre Ngozi, sponsored by Tim Hortons, 9:40 p.m. – Dre Ngozi's work is fueled by a mash-up of sounds, a true reflection of her nomadic spirit.